These are the last treats baked in the oven of my old apartment (sniff). 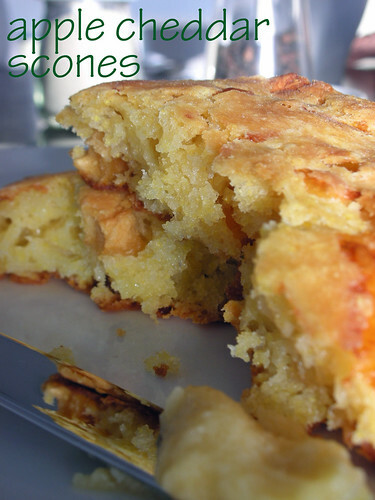 Karina of The Floured Apron has chosen Dorie’s Apple Cheddar Scones for TWD this week. If it weren’t for the group, I probably wouldn’t have made this recipe. Not that doesn’t sound good to me, it actually sounds quite good, but I just know I wouldn’t have gotten around to it. I’m so glad I got the push I needed, because I thought they were fantastic! Apples and cheddar cheese are a classic combination. I used to think it was a southern thing…then I thought it was a New England thing. I have no idea what kind of thing it is now, except for a good thing. This recipe calls for dried apples, which hold their form well in the scones, and grated cheddar (I used white), which melts into the background. The dried fruit and cheddar cheese, along with apple juice, make for a slightly sweet and salty combo that I love. Cornmeal in the dough makes them bake up golden and gives them texture. If I make them again, I’ll either scoop out the sticky dough in rounds or pat it out a bit fatter, but that’s purely for looks. I served mine with a little honey butter on the side–tasty! Sorry to keep this so short, but as I write this, I’m still in the midst of packing. A big thanks to Karina for this week’s pick! My internet connection may be down for several days due to the move, so I might not be able to check out the TWD blogroll myself this week, but you should! And check out Baking: From My Home to Yours by Dorie Greenspan or Karina’s post for the recipe for these Apple Cheddar Scones. Your scones look delicious! The texture looks perfect. We’re about to start packing, so I’m truly impressed you made time for this one! Looks delicious. yum, they look lovely and cheesey – just how I like my scones! ACK! I forgot about this recipe and still need to make it. yours look so tasty! mine were super dry, but i’m sure the honey butter would have helped… good idea 🙂 best of luck with the move! Ooo – honey butter sounds fabulous. Good luck with the moving! Seriously. Every time I come to your blog I am drooling by the end of the read. The pictures are so good I feel like that plate of scones is sitting on my desk. YUM! Apples and cheddar is classic isn’t it? That big scone looks great. Gorgeous picture – and honey butter, yum! They look great! Good luck with your move. Looks fabulous. Good luck with the move! Looks yummy! Best wishes on your move. Good luck with the move! Your scones look wonderful!! Happy moving, your scones look great! Hope to read you soon again! How great that you made these in the midst of moving — an activity that’s never without drama. So glad you liked them. Good luck with the move and I hope you’ll be up and baking many wonderful things in your new oven very soon. Beautiful job! Glad you made them, they are worth it! Oh these look and sound yummy. I love different flavoured scones, and have never done a cheese and apple one before. Nice picture of your lovely looking scones. Your scones look really wonderful and tasty. Honey butter on top…now there’s a nice idea, I hadn’t thought of honey at all. Maybe time to make some more….good luck with your move! Your scones look so moist and yummy! Good luck with your move. We thought they were wonderful, and they’re definitely on the repeat list. Good luck with your move! Your scones look delicious. Mine are in the oven right now, so I hope they turn out as good as yours. Your scones look fabulous! I just love the crispy exterior, beautifully golden! What a great recipe to make for the kitchen’s last hurrah! They look like perfect homey treats, you have a great crumb. Beautiful scones! They look delicious. Good luck with your move. They look good. Mine were a little on the flat side, but they still tasted great! I’m so glad you enjoyed the recipe! You’re scones look wonderful 🙂 They will make a good packing break snack! Your pictures are always so great. The scone looks delicious! Wow! Those are really flaky scones. Amazing pictures as usual! those look SO YUMMY!!! Good luck on the move and looking fwd to seeing you back up and running soon! Good luck in the new place. Now you can make apple cheddar scones for all of us. Just tell us when to be there. I’ll even bring butter if you want. It is a yummy recipe. I love your close-up shot. Your scones look lovely! Good luck on the move! You have the prettiest pictures! Will you come take mine?! WOW. Yours look so moist and delicious! I’d love to try this recipe! Apple and cheddar is one of my favorite combo’s too. I can only imagine what it must taste like in a hot scone.Mmmmmm!!! They look great, great job and happy new home. These scones are the perfect packing snack, actually they are just the perfect snack!